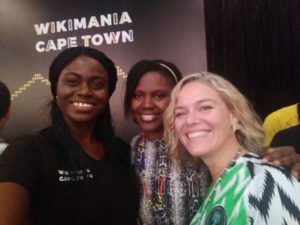 Wikimania started off with the pre -conference learning days which equipped new organizers or starters with a myriad of skills. What stood out , was determining capacities in every group and how to improve on the lacking capacities. I would sum up the learning days as skills imparted to keep a community healthy. Along side the learning days was the hackathon where i ventured into wiki data , Translate wiki (media wiki) and improving the main page on the Luganda wikipedia. The nights were as eventful as the days ranging from movie nights of Mandela long walk movie. This was a great way to celebrate Mandela and enjoy the sight of Idris Elba. The nights also included lovely poster sessions, dinners, dancing, happy hour and socializing. The conference started on 20th July, 2018 with an intense program which clarified the saying “Time waits for no Man”. Most of the programs were time bound and one needed to plan ahead of time for the sessions they were going to attend. Most mornings the whole group had one session and the session that stood out for me was creating knowledge Equity and Spatial Justice on wikipedia. It explained that most articles about Africa are written by the western world. As i went through the second day of the conference, topics like knowledge gaps, languages, increased content from the African continent and Oral citation were highlighted. The day closed off with a panel session chaired by Katherine Maher and women in Wikimedia movement panel chaired by Maria Cruz. 22nd July, 2018 marked the end of the conference as Jimmy wales gave the closing remarks and ushered in Sweden as the location for Wikimania 2019. The closing party included great African dance presentations and an unforgettable dance party. At the end of the conference, as one packs up. The greatest things one leaves with are the connections made, the friendships nurtured and support offered.